Even before 6-year-old Ella Schultz was born, she was already a miracle and had beaten many odds. Because Ella's mother, Patty, was 42 years-old when she was considering becoming a parent, and her father, Ernie, had survived cancer, neither were sure they would be able to conceive a child. Fortunately, they were able to become pregnant quickly. 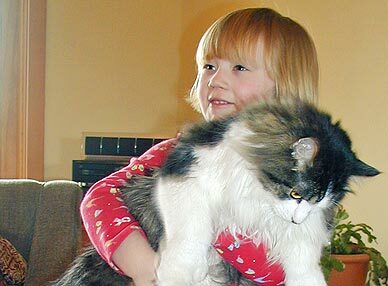 Patty's pregnancy was trouble-free, and when Ella was born, on Christmas Day in 2001, she appeared perfectly healthy. "At two months of age, however, Ella began to develop tan 'cafe-au-lait' spots on her skin, which are pigmented birthmarks," says Patty. "Because these spots can sometimes signal bigger health issues, our local doctor referred us to Mayo Clinic for testing." At Mayo Clinic, Ella met with pediatric specialist and geneticist Dusica Babovic-Vuksanovic, M.D., and was diagnosed with neurofibromatosis type 1 (NF-1). NF-1, a condition that results from mutation of the NF1 gene and is characterized by changes in skin coloring and the growth of tumors along nerves in the skin, brain and other parts of the body. Symptoms of NF-1 vary widely among affected people, although children with NF-1 almost always develop café-au-lait spots, which can increase in size and number as the child grows older. According to Patty, as Ella grew she developed more health complications as a result of the NF-1. Dr. Babovic-Vuksanovic called on other Mayo Clinic specialists to help monitor Ella's health — Seema Kumar, M.D., an endocrinologist, Anthony Stans, M.D., an orthopedist and Cynthia Wetmore, M.D., a pediatric neuro-oncologist, are just some of the physicians who participate in Ella's care. This collaboration is key to Ella's continued well-being. "The fact that all these specialists collaborate and share information about Ella is wonderful," says Patty. "On one recent visit to Mayo Clinic, we saw three different doctors. Each doctor had information from an earlier appointment that they could use to help determine their own treatments and make decisions. They also are so respectful of Ella —when she has her own questions, they really listen and focus on her directly." From 2004-2005, when Ella was between 3 and 4, her parents noticed she was growing at an unusually rapid rate —she had doubled her weight and grew 5-1/2 inches during a time when children's growth typically begins to slow. "They discovered Ella had a lesion near her pituitary gland that was responsible for the abnormal growth. It was causing her to go into puberty," says Patty. Ella was given a medication that slows her growth and prevents the progression of puberty. (Ella's condition is known as precocious puberty.) When she is older, the medication will gradually be reduced, and she will be allowed to naturally progress into puberty. Ella developed yet a further health complication of NF-1 in July 2007. During a routine MRI, which Ella receives every six months, a new tumor was discovered in her brain. A biopsy showed it to be a low-grade malignant tumor. Tumors are graded according to how abnormal they look under a microscope and how quickly the tumor is likely to grow and spread; low grade is considered the least aggressive in behavior. "More good news is that the tumor is also an encapsulated one, which means it usually does not spread through the brain," explains Dr. Wetmore, who began working with the family after the first tumor was discovered in Ella's brain several years ago. "Because of this, we are able to carefully watch Ella, versus having her undergo radiation or chemotherapy." Children with NF-1 often have scoliosis, a curvature of the spine, and Ella is no exception. Working with Dr. Stans, Ella wears a back brace when she sleeps at night and Patty reports her lower spine has begun to straighten. "Ella has to wear special large T-shirts to fit over the brace when she sleeps," says Patty. "Although she doesn't complain about the brace, she loves it when we run out of T-shirts, or if I'm not caught up on the wash, because if we are out of shirts, we allow her to sleep for a night without it." Other issues, related to the development of Ella's fine and gross motor skills are also improving, with the help of physical therapy. Despite Ella's health issues, she continues to beat the odds and is doing extremely well. The Schultz's live in rural western Wisconsin, and Ella loves exploring the outdoors with her cat, Boomer. "Ella and Boomer love to go hunting for bugs and grasshoppers," says Patty. "Ella gets dressed up as a ballerina and will go out with a butterfly net, although she can't move fast enough to catch them. But they'll work together —Boomer will catch the bugs, then lay down with his paws covering them. Ella will run up and put the butterfly net over his paws, and Boomer will pull his paws back." From both a personal and medical perspective, Dr. Wetmore agrees Ella is thriving. "She is a wonderful, upbeat child," says Dr. Wetmore. "And with the coordinated care she is receiving, she will live a long and happy life." I don’t know if it is possible, but I would love to get in touch with the Schultz family. I was Ella’s teacher when she was in Preschool at Richfield United Methodist Church. 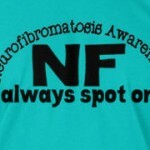 I also have NF1. It has been years since I have seen Elle or her parents due to their movie. So if it is possible to get in touch with them, I would love to!